"Discriminatory social institutions intersect across all stages of girls’ and women’s life, restricting their access to justice, rights and empowerment opportunities and undermining their agency and decision-making authority over their life choices. As underlying drivers of gender inequalities, discriminatory social institutions perpetuate gender gaps in development areas, such as education, employment and health, and hinder progress towards rights-based social transformation that benefits both women and men." The first edition of the SIGI dataset was first launched in 2009, and then updated in 2012, 2014 and 2019. 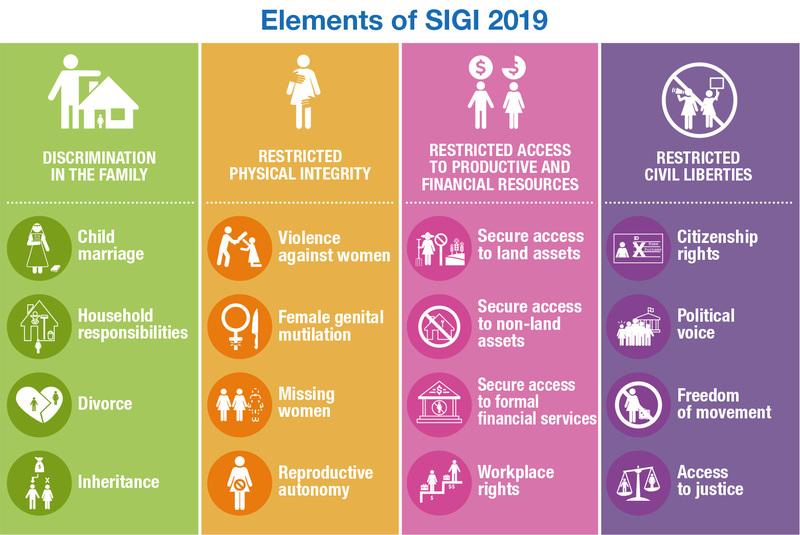 The SIGI 2019 is built around four sub-indices, namely discrimination in the family, restricted physical integrity, restricted access to productive and financial resources, and restricted civil liberties. What are the objectives of the dataset? The Social Institutions and Gender Index (SIGI) is an index designed to measure gender equality in a society. SIGI is a composite index of gender equality. It focuses on formal and informal social institutions that impact the roles of men and women, such as a society's norms, values and attitudes that relate to women. The variables span all stages of a woman’s life in order to show how discriminatory social institutions can interlock and bind them into cycles of poverty and disempowerment. 10 variables on prevalence rates describing the level of discrimination in practices. Very High (SIGI>50%): 12 countries, representing 10% of the countries ranked. Currently, 24% of the countries ranked in the SIGI 2019 - that is almost one country every four - show high or very high levels of gender discrimination in social institutions. The SIGI is an initiative of the Organization for Economic Cooperation and Development (OECD) Development Centre. This sub-index captures social institutions that limit women’s decision-making power and undervalues their status in the household and the family. Do discriminatory social institutions matter for food security? In view of the 2012 United Nations Commission on the Status of Women’s thematic focus on rural women’s empowerment, the gender team at the Development Centre has launched an issues paper, “Do discriminatory social institutions matter for food security?”. 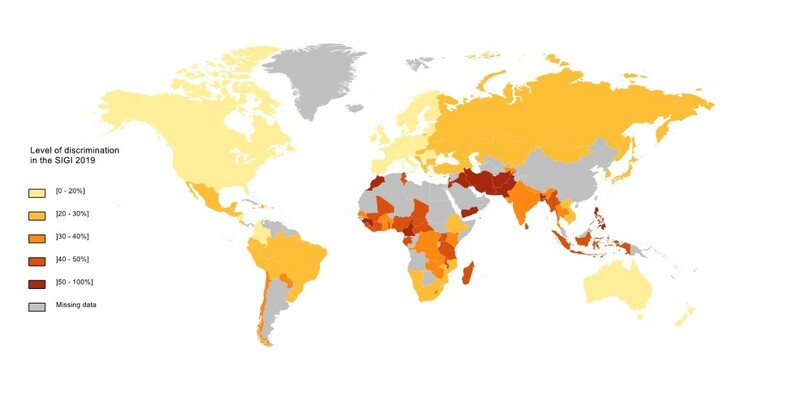 Leer más sobre Do discriminatory social institutions matter for food security? The first part of the indicator focuses on the incidence of people with ownership of secure rights over land, while the second part focuses on the gender parity and the extent to which women are disadvantaged in terms of ownership or use rights over agricultural land. The focus of this indicator is on agricultural land, which is commonly viewed as a critical resource for ensuring poverty reduction in many developing countries. The Burkina Faso-SIGI country study is a tailor-made policy and research tool, adapting the methodology and conceptual framework of the global SIGI to the national context. The adapted Burkina Faso-SIGI framework is the result of consultations, workshops, in-depth research and field surveys. The Uganda-SIGI shows that investments in reducing gender inequalities holdimportant potential to improve women’s rights and reduce gender gaps. Over the pasttwo decades, Uganda has achieved solid progress, courtesy of comprehensive laws andpolicies strengthening women’s political participation and land rights, among others. How can women be integrated in processes of democratisation? The participation of women in political and economic processes is essential for democratic governance. The PROWID grants system supported activities such as lobbying and advocacy, skills development and developing institutions to further women's social and economic rights.